Firstly, I wanted to create a ship that looked like it might actually be able to achieve lift, and not just be a box of metal being propelled forward by a giant rear thruster. Secondly, the idea fixed position main gun seemed ridiculous for a model that’s meant to be a Gunship. And thirdly, there were lots of minor issues with the framework and the orientation of secondary systems modelled on the original, so I wanted to tighten the ‘practical’ elements of the design up a bit, if possible. 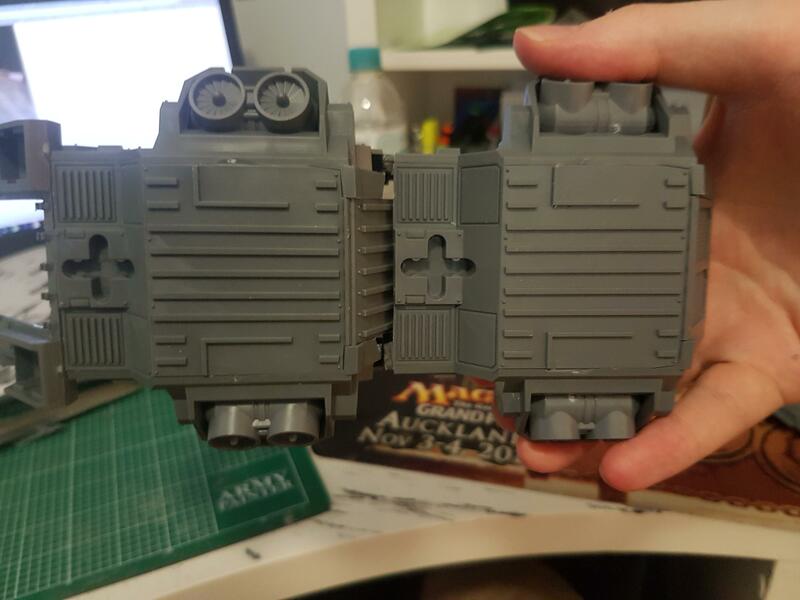 I started with the hulls of two Stormraven Gunships since they’re practically mini Thunderhawk Gunships anyway. I began with the concept of using the two upside down and strapping a tank on the rear. But I threw this out almost immediately though because it embodies almost everything I hate about the Thunderhawk Gunships design. Instead, I had the idea to combine them human centipede style. But as evident by the image below, I did not measure twice and cut once. I thought this would easily be solved with plasticard and greenstuff, but this actually caused severe structural problems. And further into the build the two hulls misaligned and the slight offset was only accentuated as the framework became more and more developed – but more on that later. 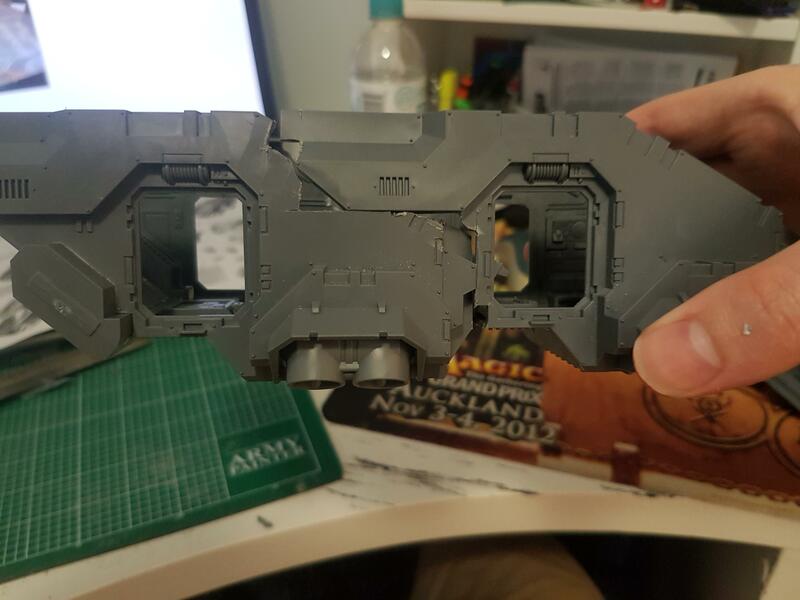 The idea behind using the Stormraven Gunships as a basis was that by having a base of 4 vertical thruster housings in the hull, plus however many additional on the wings, the vehicle would look like it could actually land and take off. Independently. Once combined, the frames also have strong lines and some basic semblance of aerodynamics. Additionally it gave me a whole bunch of internal detail already sculpted. 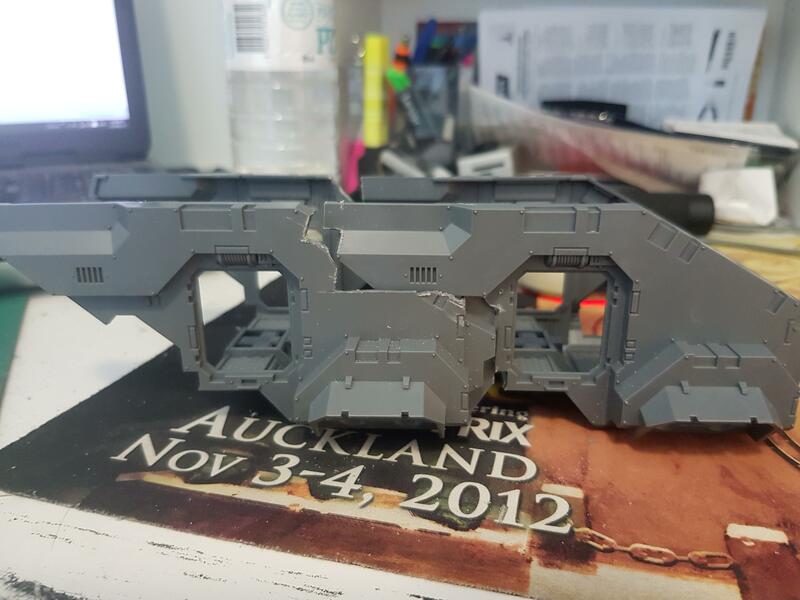 Plus, I was planning on using all the additional weapon bits to truly outfit my new machine as the beast a Superheavy Gunship of the Astartes should be. After some heavy cutting, sanding, bending, and cursing, I was very happy with how the two frames ended up fitting together. But I was so preoccupied with the two ends meeting, there was an oversight. On the underside, we’d sprung a huge leak. There was a huge gap where the second assault ramp meets the first frame. My mind started to race with options for fixing or incorporating this into the build. Thunderhawk Gunships can be equipped with bombs, maybe I could turn it into bomb bay doors. Or perhaps I could close the gaps and used the recessed area as a solid flying stand attachment point, seeing as it will end up being almost dead on with the models center of gravity. In the end I decided to go with the flying stand idea. I really wanted this bad boy to be stable on the battlefield and not crash and burn from table bumps. In part 2, i’ll start the gap filling and improving the structural integrity of the frame. We’ll also look at main weapon mounts. Have any questions about the build or maybe you’re building something yourself? Let me know in the comments below. Or read part II here. Geopolitics | Criminology | Marketing - Just the boring things in life.